Retrofit replacement for fluorescent tubes T8 / T10 - 150 cm, 58 Watt, twist/fixable base G13, the tube can be optimally aligned. 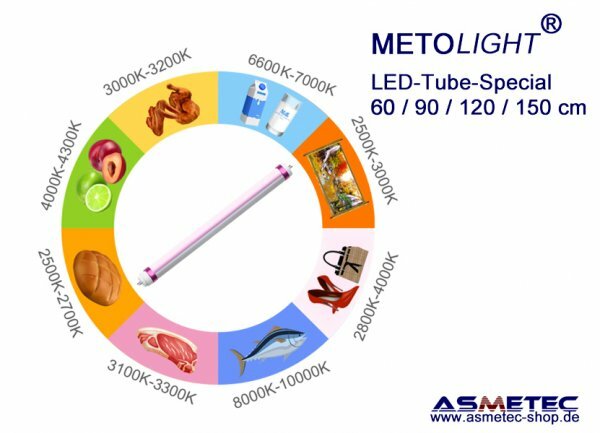 The METOLIGHT LED tube of the MEAT series is significantly brighter than a conventional fluorescent tube 150 cm / 58 Watt - T8 - saves more than 50% energy with a shelf life about 10 times longer. The matt cover provides glare-free light at a light angle of approx. 120°-140°. In the MEAT-RBW version, the light is generated by red, blue and white LEDs, with red and blue tones predominating and dark meat such as beef appearing in its natural colours. 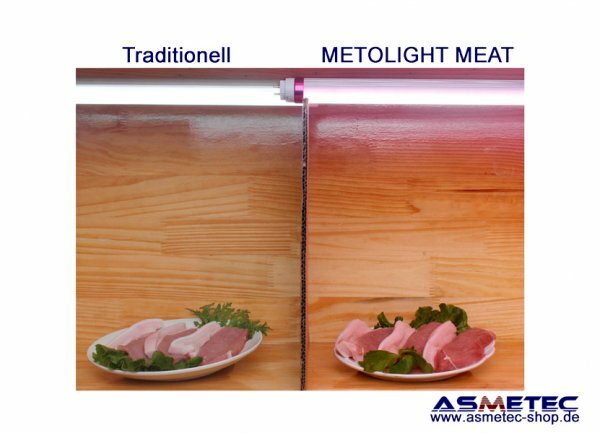 Studies found that beef stored in the dark for three to ten days did not change colour significantly, while beef stored under fluorescent lamps for the same period of time turned brown after only five days. A 28-day study conducted at the University of Zaragoza in 2000 showed that ultraviolet light has a profound effect on the rate of meat spoilage and the formation of metmyoglobin, the pigment that gives meat a brownish surface color.The microorganisms, which attach themselves quickly to fresh beef and are primarily responsible for the spoilage of beef in the refrigerated counters of food stores, are psychrotrophic bacteria, i. e. those that can grow at cold temperatures and belong to the genus Pseudomonas. 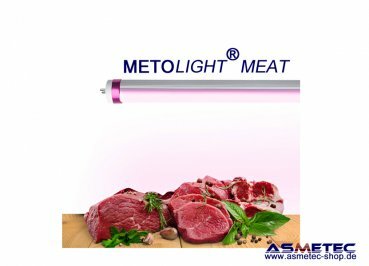 While these bacteria are not harmful in themselves, they contribute to the discoloration and spoilage of beef by accelerating the oxidation of myoglobin to metmyoglobin, the pigment that makes fresh meat look brown and reduces the shelf life of fresh beef to 2-3 days. METOLIGHT LED tubes of the MEAT series do not emit UV light and protect the meat.